The Goods Piso vase S white-blue has an appearance that is as sturdy as it is colorful. The combination of a rectangular vase with a curved neck ensures a playful effect. On top of this, the necks of the Piso design vase are always thrown into a different corner; combined with the larger size or a Goods Piso vase in a different color, a style element full of contrast will emerge in your interior. The Piso vases are especially suited for one or several flowers. During the ceramic process, designer Olav Slingerland uses molding clay. By shaping the mould of the vases a little differently every time, the necks of these small Piso vases each have a different corner. 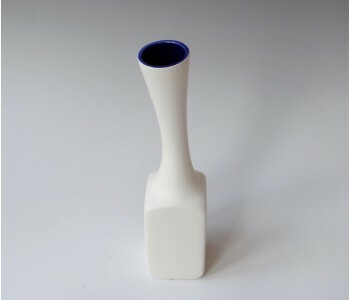 As a result, every Goods Piso vase is unique. The Piso white-blue by Goods is made in a small/medium series by Slingerland. Therefore, each vase reflects the touch of the master!